Add mushrooms to the pan and stir to coat as evenly as possible in the fat. 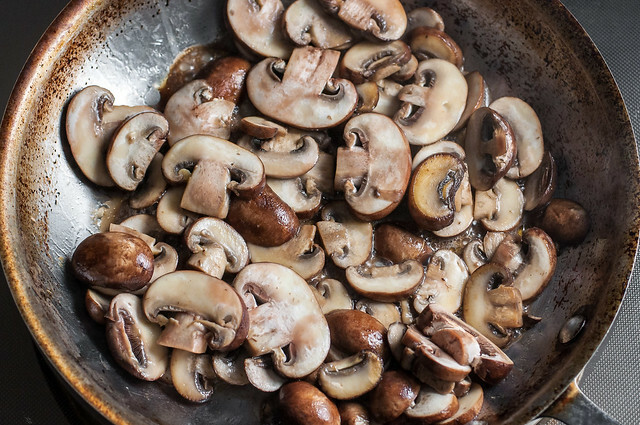 The first mushrooms to hit the pan will absorb some of the oil, and it’s fine if every mushroom isn’t equally coated–just do your best. Do NOT season the mushrooms at this point. 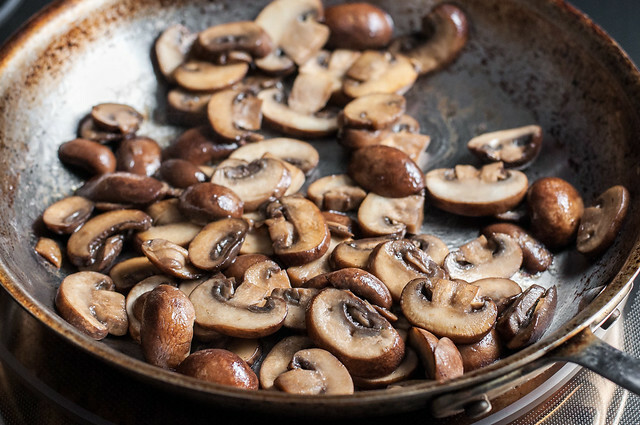 Without stirring, leave mushrooms to cook in the skillet for 2 to 3 minutes, to brown the first side. Continue to cook the mushrooms, stirring every minute or two, not frequently. After a while (around 5 minutes, but it varies), the mushrooms will release moisture into the pan. It will look like you added water, and the sound will change from sizzling to bubbling. Continue cooking in the same way, allowing the liquid to simmer. When you notice the liquid has just evaporated (about 5 to 6 minutes later), continue cooking the mushrooms, now stirring every 15 to 30 seconds, for a couple minutes. 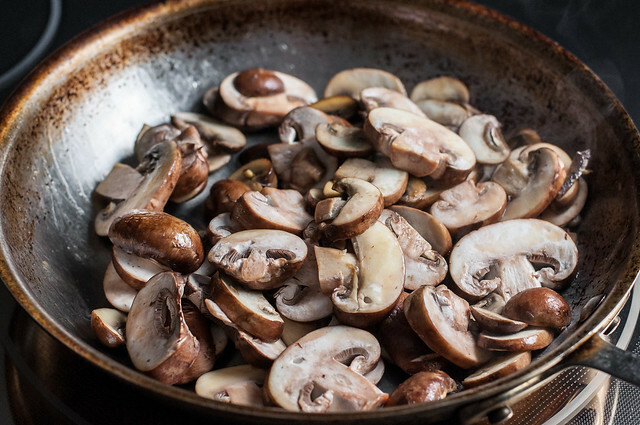 In some cases, a recipe will dictate that you only cook the mushrooms to a certain point, leaving them in the liquid, but when not specified, always cook until the pan is dry when a recipe says to sauté mushrooms. Turn off heat and season as desired, with salt (or truffle salt), pepper, and/or fresh herbs. 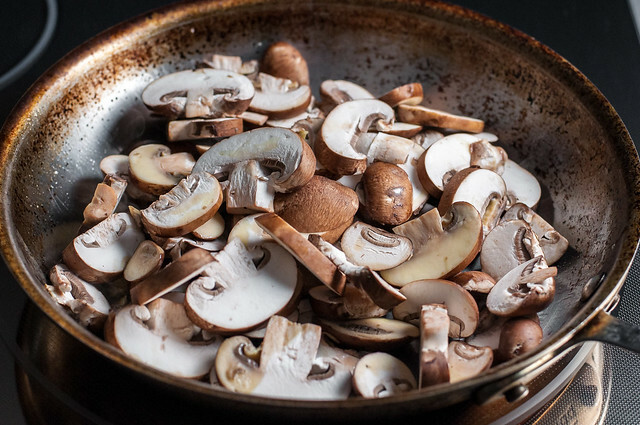 To serve the mushrooms as a simple side dish, toss in a little butter, olive oil, or truffle oil before seasoning. Remove to a serving dish or proceed as directed with whatever recipe you’re using. Let a dry skillet begin to heat at just over medium (or a little higher if not using butter). After a couple minutes, add the fat. A tablespoon each of butter and oil will yield beautiful browned mushrooms with just a little bite to the outside. 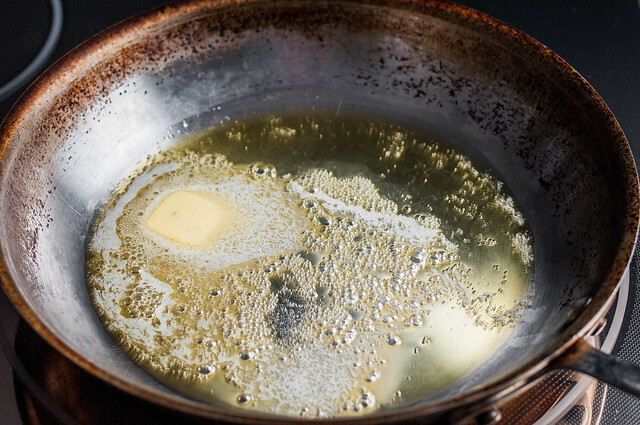 Heat until butter is melted and/or oil is hot and shimmering. Add mushrooms to the pan and stir to coat as evenly as possible in the fat. 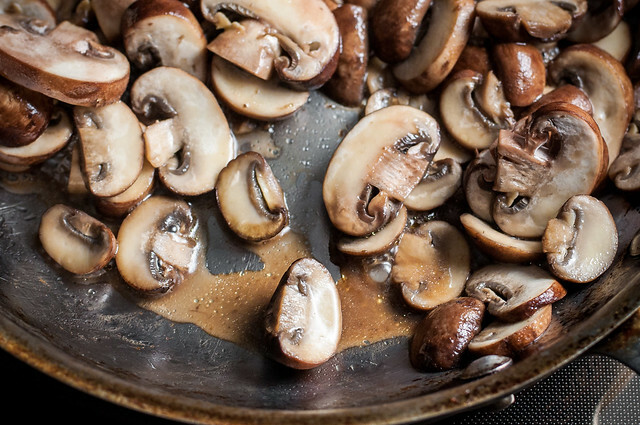 The first mushrooms to hit the pan will absorb some of the oil, and it's fine if every mushroom isn't equally coated--just do your best. Do NOT season the mushrooms at this point. 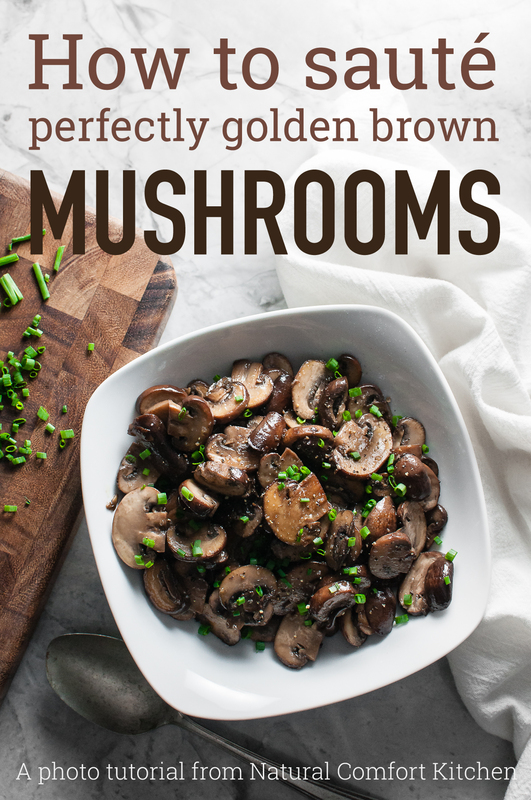 Without stirring, leave mushrooms to cook in the skillet for 2 to 3 minutes, to brown the first side. Continue to cook the mushrooms, stirring every minute or two, not frequently. After a while (around 5 minutes, but it varies), the mushrooms will release moisture into the pan. It will look like you added water, and the sound will change from sizzling to bubbling. Continue cooking in the same way, allowing the liquid to simmer. Turn off heat and season as desired, with salt (or truffle salt), pepper, and/or fresh herbs. 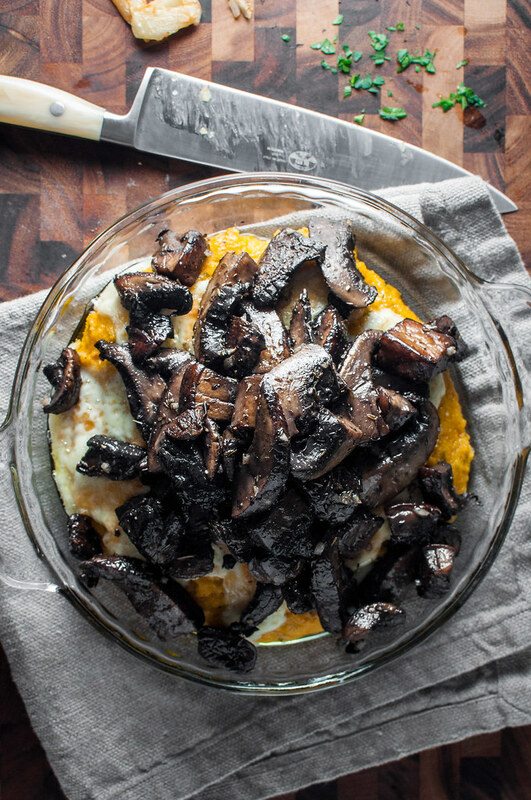 To serve the mushrooms as a simple side dish, toss in a little butter, olive oil, or truffle oil before seasoning. Remove to a serving dish or proceed as directed with whatever recipe you're using. Mushroom asparagus crepes are a delicious French-inspired-meets-comfort-food way to use sautéed mushrooms creatively. When I serve sautéed mushrooms as a side dish (i.e., keep the entire bowl to myself for dinner), I mix it up with different seasonings every time. 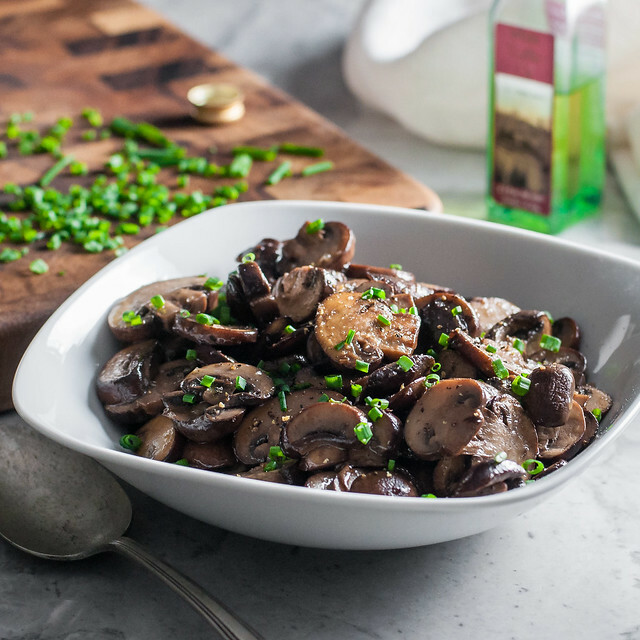 To dress up your mushrooms a bit, hit them with a tiny dash of truffle oil to enhance the mushroom flavor, plus a sprinkling of chopped fresh herbs, like the chives I used. No truffle oil? A little more butter stirred in at the end will also make for some pretty fancy and tasty mushrooms. Maybe you most often see mushrooms piled on top of your juicy steak, but after cutting 95% of my prior meat consumption from my diet, I’ve come to love mushrooms even more. They have that juicy, meaty texture that I definitely still crave, plus that mysterious umami flavor that helps them enhance so many different dishes. I had a problem cooking mushrooms, though. Of course, I remember my mom teaching me not to stir mushrooms that often when you sauté them, giving them a chance to tenderize, so that part I had down. Step away from the mushrooms. However, about every other batch, I would end up with just way too much mushroom juice that seemed like it would never reduce, so I drained them, only to have them release more juice as they rested. First, please don’t condemn me for discarding that super flavorful liquid. Amateur mistake of discarding valuable flavor. Second, a little research revealed that everything I was doing was as expected, and all I had to do was raise the heat a bit and be patient. It’s impractical for every recipe involving mushrooms to provide this much detail about how to properly cook them, but the juice problem is still frustrating! 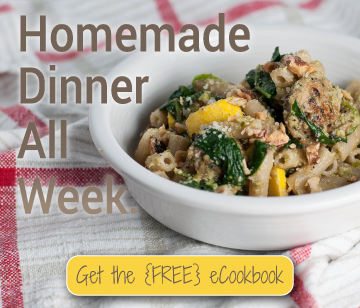 Whether you’re whipping up a fancy steak dinner with that beloved mushroom topping or maybe just cooking a new Pinterest pasta recipe, you’ll know exactly what to do next time you see the instructions, “cook and/or sauté mushrooms.” Be gone overly juicy mushrooms! What if the mushrooms don’t release any liquid? Don’t panic, it can happen. From my experience, certain types of mushrooms don’t release as much liquid during cooking (especially the fancy types), and other times, I just had the heat a little too high. The best thing to do if it becomes apparent your mushrooms are not juicing as expected is turn down the heat a bit. This will allow them to finish tenderizing without burning on the outside. Okay, I don’t want to get virtually assaulted if you go out and buy some super expensive morels or shiitakes and then maybe ruin them by following my instructions. I’m not positive: this method may work for those mushrooms, but I almost always purchase your typical grocery store variety mushrooms. White button, portobellos, and baby bellas. Or maybe if I’m feeling extra hipster I’ll get the “local” brown buttons that you bag yourself but still look relatively commonplace. The varieties I’ve specified above, the less fancy fungus, will all do great with this method for the mushroom sauté. However, unless you have tons of cash to burn, I must recommend following the instructions of a specific, well-written recipe when cooking less common mushrooms. And please, please please PLEASE, do not ever touch your $1,000-per-pound imported truffles to a hot skillet. It’s not essential to scrumptious, earthy sautéed mushrooms, as I’m sure many a vegan will tell you. However, unless I’m on a super healthy kick, I almost always use a mixture of butter and oil to sauté mushrooms. Butter is great because it adds lots of flavor and produces a nice golden brown exterior, while adding oil allows the mushrooms to cook a little more quickly at slightly higher heat. 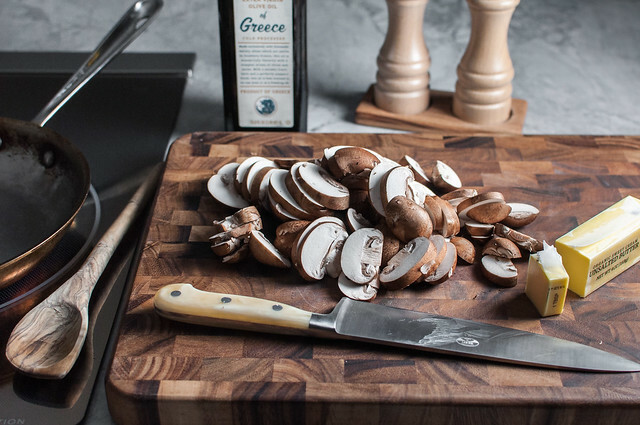 At the end of the day, it’s completely up to your preference–a couple tablespoons of good olive or other oil will still yield perfect sautéed mushrooms. Perfect way to do mushrooms!! Wouldn’t change a thing!! They always come out absolutely delicious. Cooking them until the skillet is dry is the secret. My mouth is literally drooling. I have never actually cooked mushrooms myself until after I was forced into the surgical room with a “must have TIFF” and a “LAP Hiatal Hernia Repair with mesh”. I really thought they just wanted my money (lol) but after the surgery I felt so much better. I was told by my surgeon that I was deathly low on Vitamin D and I need to take care of it now. Thumbing through recipes on Pinterest, I saw your post on sauteed mushrooms and how easy it seemed. Now, I was still at the stage of puree foods only, after my surgery, but why cant you puree cooked mushrooms and tomato soup? So I set out to create my concoction with your help. How was it? I’m still drooling typing each word. Thank you!!!! !